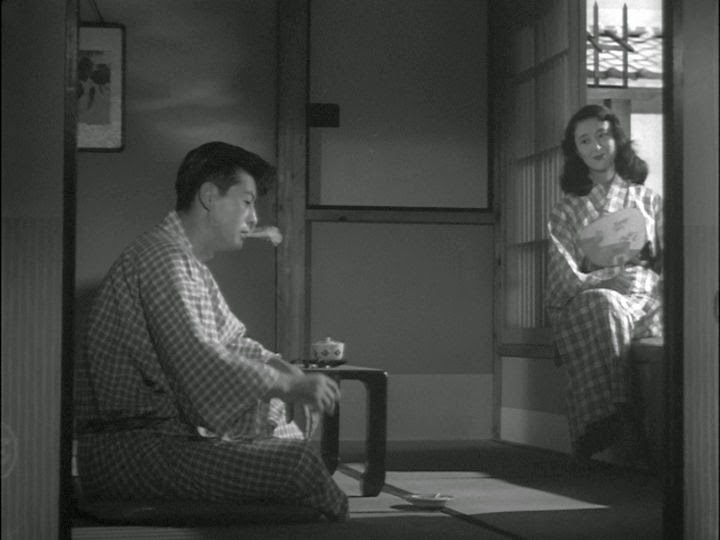 Yasujiro Ozu’s last black-and-white film, Tokyo Twilight (Tokyo Boshoku, 1957), was one of his darkest works – even more downbeat than his preceding effort, Early Spring (1956). This was the case despite the fact that, unlike his usual examinations of family life from a multi-generational perspective, these two films focused mainly on young people, who we might expect to be more enthusiastic and upbeat than their elders. In Tokyo Twilight, though, the viewer is presented with the story of two adult daughters of a middle-aged banker who are very unsatisfied with their respective circumstances. How this story is told is what makes it interesting. As with most all of Ozu’s films, the pace is leisurely, tracking the everyday life of ordinary middle-class people going through their mundane activities. Scenes are entered into without much framing or contextual setup, and slow disclosure is used concerning the relationships that exist among the characters. It can take a few minutes to discover the existing relationships among the characters in a given scene. Shukichi Sugiyama (played by Chishû Ryû) is the middle-aged banker and father of two daughters. 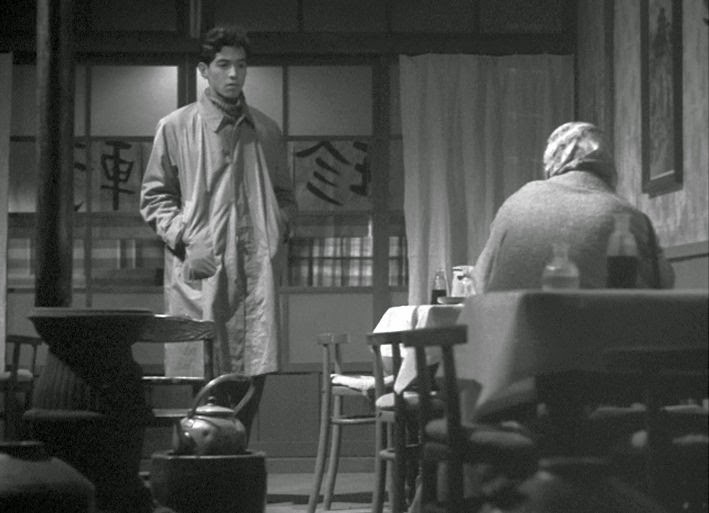 The always sympathetic Chishû Ryû was a longtime Ozu favorite and appeared in 52 of Ozu’s 54 films. 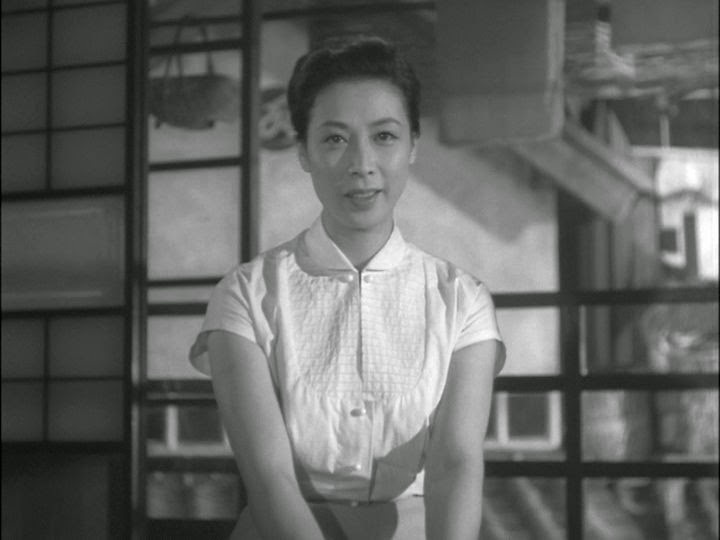 Takako Numata (Setsuko Hara), the older daughter of Shukichi, is married to a professor and has a two-year-old daughter. 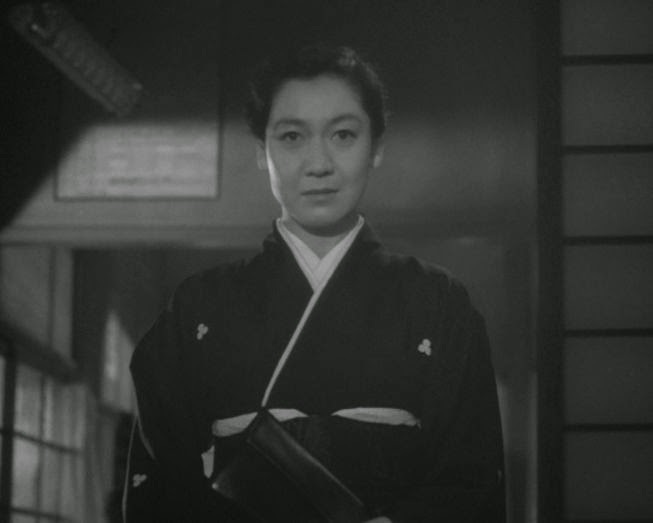 Akiko Sugiyama (Ineko Arima) is the younger and unmarried daughter of Shukichi. Kisako Soma (Isuzu Yamada), a middle-aged woman, is introduced as the proprietor of a Tokyo mahjong gambling parlor. The story of Tokyo Twilight unfolds as essentially a series of short conversations – more than 26 scenes, none more than six minutes in length. But the psychological atmosphere surrounding these conversations has a cumulative, almost noirish, effect that sustains interest throughout the drama. These episodic, usually gloomy, conversations are woven together into a narrative that gradually moves through roughly four phases. 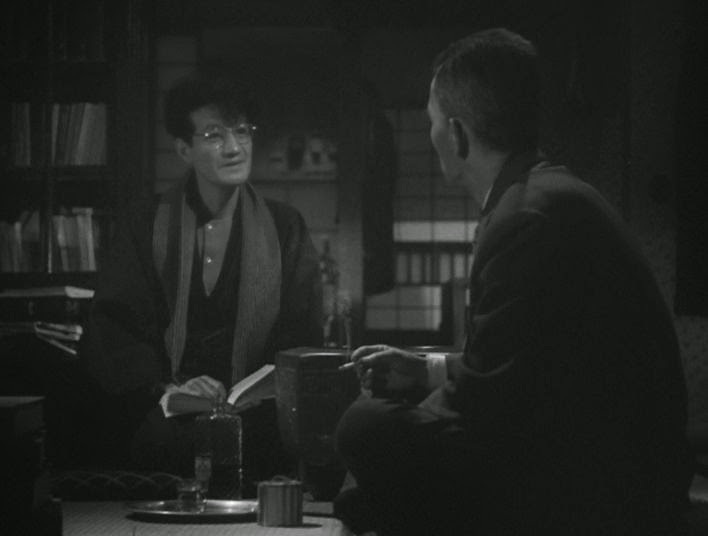 In the early scenes, the viewer is introduced to a middle-aged banker, Shukichi Sugiyama, and it seems possible that the film will be about him. But in fact this tale turns out be entirely about women and the difficulties they were faced with in contemporary Japanese family life. Shukichi has two adult daughters: Akiko, college-aged and still single, and her older sister Takako, who is married. The absence of their mother is not explained at this point, but she will appear later. Takako has a troubled marriage and has just left her husband and taken her two-year-old daughter to come and live with Shukichi. The word is that her husband, Professor Numata, is selfish, abusive, and a borderline alcoholic. Shukichi goes to Numata’s home to talk politely about the situation, but the professor proves to be detached and evasive, and nothing comes of their meeting. On another occasion, when Shukichi has lunch in town with his sister, he learns that his younger daughter had asked the woman, without telling her father, to loan her a substantial sum of money, 5,000 yen. So Shukichi now has two worries: Takako’s marriage problem and why Akiko needs money. The two daughters are quite different, though, and this is reflected in their external mannerisms. Takako is traditionally attendant to her father and wears traditional clothing, while Akiko wears Western clothing, acts nonchalant, and smokes cigarettes. It would seem that the story will now cover these two issues with equal weight, but that turns out not to be the case. 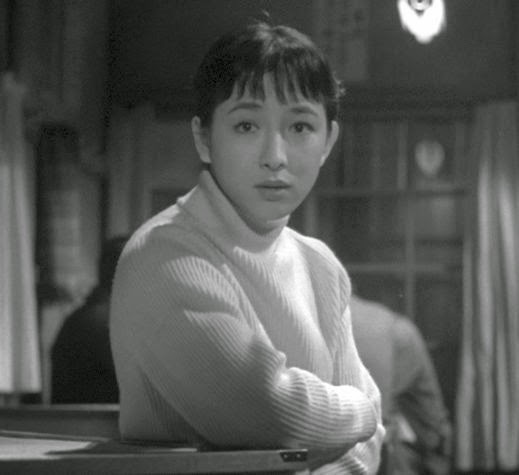 The rest of the film really revolves around Akiko, who is movingly portrayed by one of Ozu’s most beautiful performers, Ineko Arima. Akiko is trying to track down her elusive boyfriend Kenji so that she can talk to him, and she visits his flat, some bars, and a mahjong parlor in search of him. At the mahjong parlor the lady proprietor, Kisako, takes a warm interest in Akiko and tells her that she knew her family years ago when they lived in another town, Ushigome. Eventually Akiko runs into Kenji and confronts him with the news that we already suspected: she’s pregnant. Kenji is clearly irresponsible and even suggests to her that he may not be the father. He runs off and tells her to wait for him later on that evening, at 9:30pm, at a cocktail lounge so that they can discuss things further. Akiko dutifully goes there and waits, but Kenji fails to show up. Then, in a sequence that I found curious, Akiko gets arrested by a plainclothes policeman and taken into custody. For what crime? 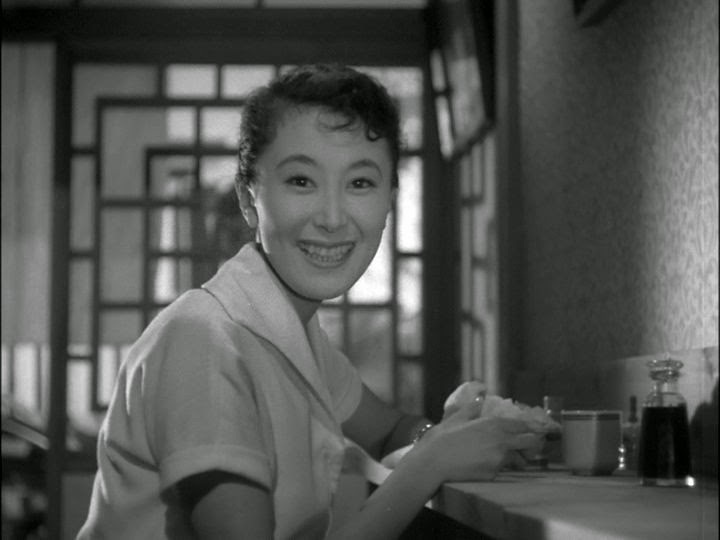 The cop tells her that, “a girl shouldn’t stay out late alone for any reason.” This incident, which seemingly has little to do with the main story, is connected with an important theme in the film: the dubious and confused roles that women were (variously) understood to have in Japanese society. Takako rushes to the police station to take Akiko home. Akiko, now seriously depressed and feeling abandoned by everyone including her now frowning father, moans to Takako that she should never have been born because she wasn’t wanted. From Akiko’s comments and other sources, Takako figures out that the mahjong parlor woman, Kisako, is actually their long lost mother who had abandoned the family and run off with another man many years ago when they were children. Kisako is now married to a different man and had only recently come to Tokyo. Filled with revulsion for her errant mother, Takako goes to confront Kisako, hatefully tells her off, and orders her not to reveal her identity to Akiko. 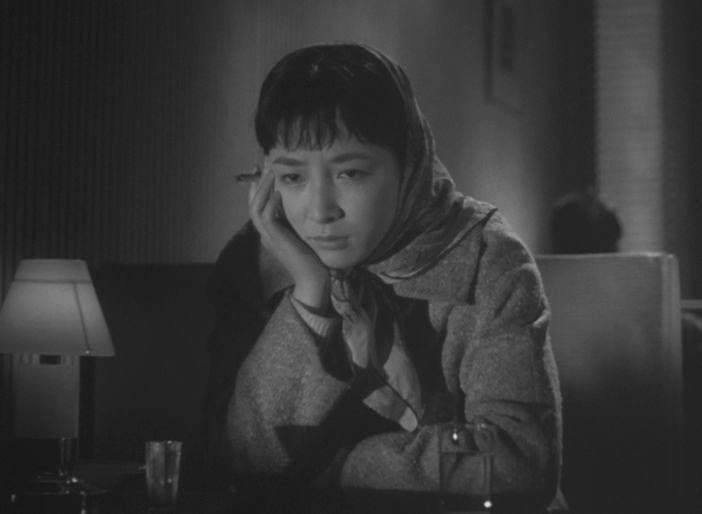 Meanwhile Akiko, having managed to borrow money from another source, goes to a clinic and goes through the anguish of getting an abortion (Japan had legalized induced abortions in 1948, but it was probably an ongoing subject of controversy for Japanese society ). While Akiko is off having her abortion, Shukichi is taking time off from work to visit his favorite pachinko parlor . Later when Akiko learns that Takako had gone to the mahjong parlor, she mistakenly fears that Takako had learned about her pregnancy and abortion (which was still a secret to the rest of her family), so she confronts Takako about why she had gone there. Takako responds angrily what she had intended to keep secret: that the mahjong parlor owner is their mother. Akiko then goes to Kisako and expresses her own hatred for having been abandoned, even questioning her mother as to who her real father might be. Akiko finally runs into the elusive and uncaring Kenji at a noodle shop, but the encounter so upsets the girl that she bursts into tears and runs distractedly out into the street. 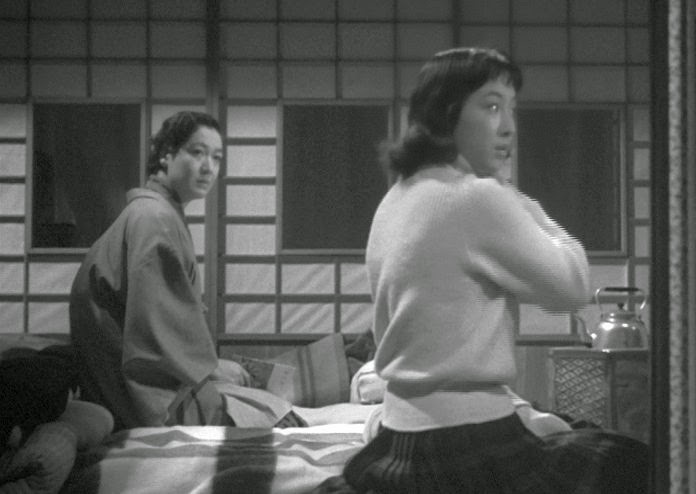 In a classic instance of Ozu’s ellipsis, the scene shifts to a hospital ward, and it is revealed that the distraught girl had been hit by a trolley. With her father and sister at her bedside, she now swears that she doesn’t want to die; she wants to start everything over. But it is too late, and the most important character in the film is gone, just like that. Takako goes to Kisako and hatefully tells her that Akiko’s death is ultimately the fault of her runaway mother. Faced with such venomous rejection from her old relatives, Kisako agrees to go away with her husband and live in another city. Before leaving, she gives an offering for Akiko to Takako and tells her that she is leaving on the evening train to Hokkaido. She hopes that her only daughter will break down and see her off at the train station. 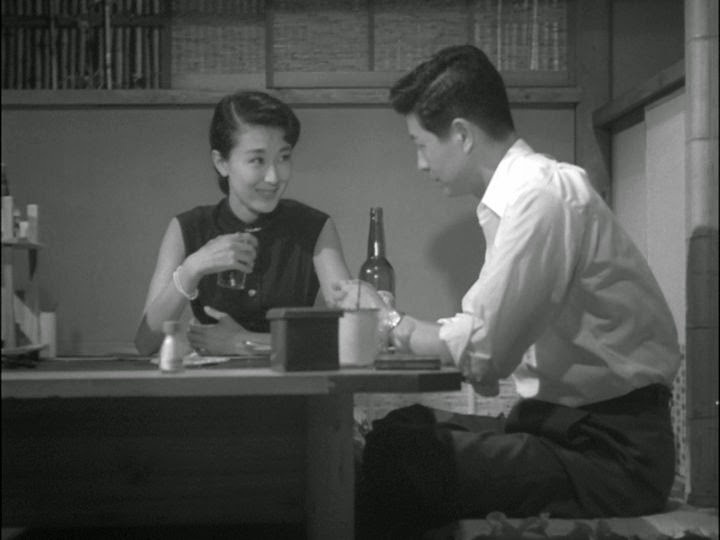 Ozu stretches out the anticipation of this possibility as if it might really happen, but Takako doesn’t budge. Kisako departs presumably never to see her daughter again. In the final scene, Takako tells her father that she intends to return to her husband and try and make their marriage work. She says she is doing this for her daughter, because a child should not grow up without the presence of both parents around her. So finally, Akiko, Kisako, Shukichi, and Takako have gone off in different directions without any solace or grace. In case you might think that the Tokyo Twilight ends on a relatively positive note, let me assure you that it does not. Takako’s closing vow to return to her husband is not an act of love, but more an expression of anger over the fact that she and Akiko were raised without a mother’s love. This is an implicit criticism of Shukichi, too, since it implies that his fatherly love just wasn’t enough, by itself. Takako, the traditional girl, often offers ingratiating smiles, but they seem forced. She remains bitter about her husband and bitter about her mother’s abandonment. Kisako appears to be very benign throughout the film. She acknowledges that she had erred in the past, and when she is condemned by her own daughters in the present, she accepts the verdicts stoically. There is something in her countenance that suggests warmth and compassion. But still she is made to suffer. Akiko, the modern girl, is condemned by everyone for having fallen in love with a man and succumbed to his embraces. Everyone she meets think that she is just a tramp, but she, too, appears to be a sincere and compassionate person. Interestingly, she almost never smiles in the entire film – somewhat unusual in a culture where smiles are almost required by protocol. And yet she comes across as the most open, unguarded person of them all – the one most ready to commit totally to love. All three of these women, each faced with trying circumstances, really just want to love, but they are denied. In fact they should not only not be condemned, but be loved in return. That is what Ozu is showing us here. 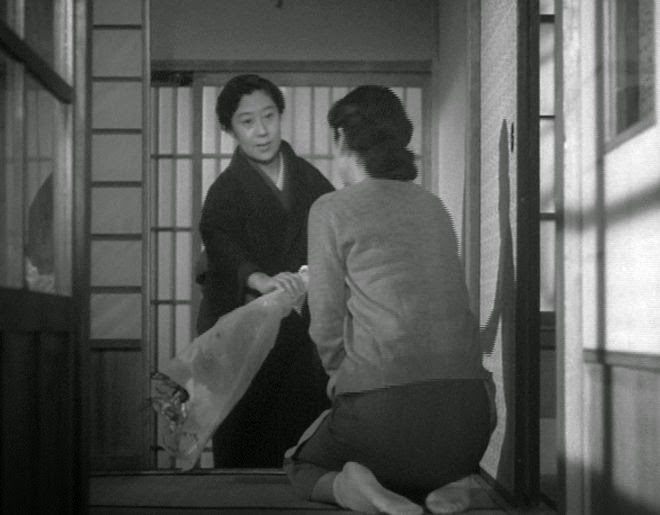 Ozu’s previous film, Early Spring, had also alluded to the issue of abortion in one of the minor subplots. The first commercial parlor for pachinko, a sort of pinball slot-machine, was opened in Japan in 1948, so they were a relatively new way to waste time. Federico Fellini’s La Dolce Vita (1960) won the Palme d’Or (“Best Picture”) at the Cannes Film Festival and was his biggest hit with the public. For American viewers, though, its popularity was probably due to its perception as a phantasmagoric parade of European decadence among the privileged classes. But underlying and unifying the film’s episodic and histrionic extravagances is something more interesting – a philosophical quest for life’s ultimate fulfilment. Of course, the search for life’s meaning can be said to lie in the background of almost all stories, but La Dolce Vita’s almost picaresque journey through the various quarters of Roman pleasure-seeking represents a beautifully artistic articulation of this quest. Marcello Rubini (played by Marcello Mastroianni), an aspiring writer who currently toils as a tabloid journalist. Sylvia (Anita Ekberg), a hyper-glamorous Swedish-American movie star. Paparazzo (Walter Santesso), a free-lance photojournalist and representative of the class of lower-class publicity hounds in modern urban life. His character name became eponymous with an entire class of frantic, media-chasing mindlessness. The story of the film comprises a sequence of expressionistic episodes, almost like symphonic movements, that follow Marcello’s search path towards . . . what? It’s not simply enlightenment that he seeks, but something more complete – that which we all seek, a life of fullness and total engagement. We can call it “love”, but it is almost inexpressible. 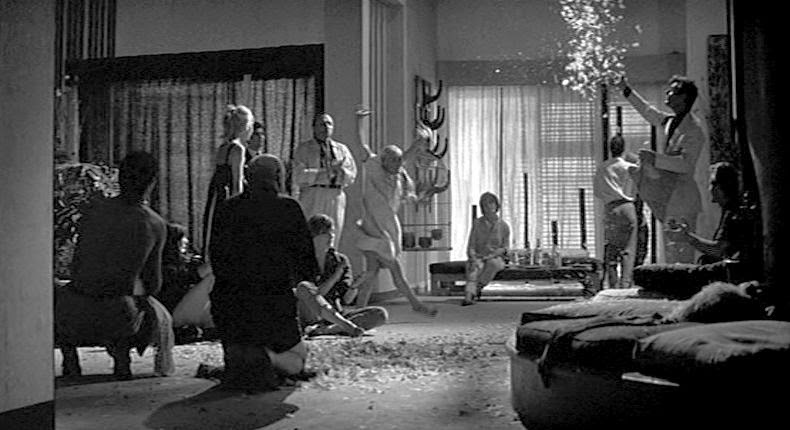 The genius of Fellini was his ability to choreograph cinematically these kinds of feelings by means of expressive characterizations and group interactions in dynamic, involving environments. Each of the episodes represents a specific tangent of Marcello’s quest for fulfilment. For the most part, a given episode involves an evening of increasing delirium that ends with the cold light of morning daylight. 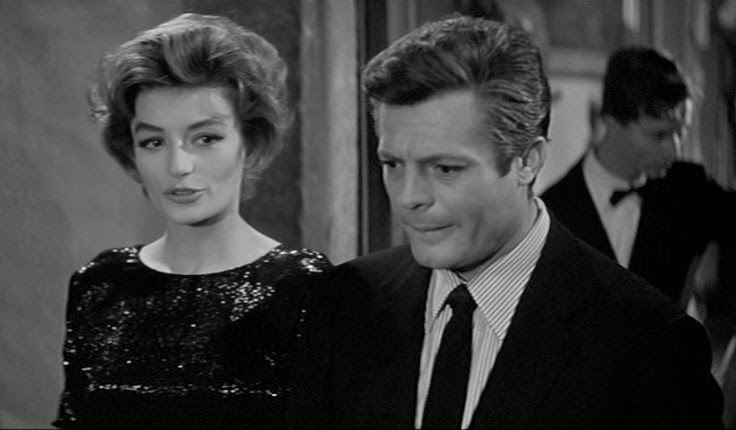 The opening scenes feature the frenetic life of Marcello, the tabloid journalist, who frequents nightlife on the Via Veneto in search of celebrity scandals. He is often accompanied by Paparazzo, who seeks to take candid shots of celebrities in distress. At a nightclub, Marcello runs into an old friend, the beautiful and engaging Maddalena. Maddalena is so rich that she is bored with all of Rome; but Marcello says he likes Rome, because it is a jungle in which he can conceal himself behind many different roles. To amuse themselves with a game, they go off and pick up a prostitute so that they can use her place to have their own sexual tryst. 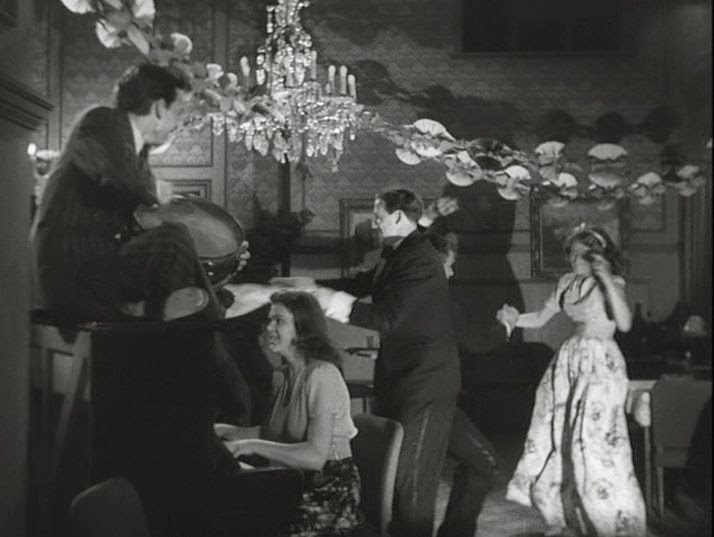 These early sequences also introduce the viewer to Emma, Marcello’s clinging fiancé, who is literally suicidal whenever she suspects Marcello might stray. Thus from the outset, one sees Marcello torn between two unsatisfactory choices: the lascivious Maddalena, who only offers momentary pleasures, and Emma, whose obsessive possessiveness is oppressive to him. In perhaps the most famous sequence of the film, the extravagantly buxom movie star Sylvia visits Rome and so, unsurprisingly, comes to the attention of Marcello and the other media hounds. Marcello is immediately infatuated with the luscious beauty, but what he sees is only a voluptuous mirage, not the promise of a fulfilling relationship. Another news event to be covered is the reported miraculous sighting of the Virgin Mary by two lower-class children, which has caused a frenzy on the part of the religiously-devoted Italian public. This is also a memorably staged scene – here of religious enthusiasm run rampant, and the tradition-bound Emma is caught up in it, too. The crowd of worshipers that surrounds the two fantasy-inspired children grows unruly, and then chaos ensues when a rainstorm disrupts the activities. It all ends in chaos and acrimony, a far cry from whatever message of spiritual harmony that is supposed to be the foundation of religious narratives. So by this point, more than 70 minutes into the film, there have been three less-than-satisfactory sociocultural illusions presented: (1) the conflicting allure of sexual loyalty (to oneself) and freedom (for oneself), (2) the illusory imagery of bewitching beauty, and (3) the limitations of conventional religion. "Safety is not being locked up in one’s home. . . . A more miserable life is better, believe me, than an existence protected by a perfectly organized society." "Sometimes at night, this darkness, this silence, weighs on me. Peace frightens me. I’m afraid of peace. It looks like an appearance hiding hell. I think of what my children will see tomorrow. They say the world will be beautiful. How? A phone call can announce the end of the world." "One should live beyond emotions in the harmony of art works. .in the enchanted order. . . We should learn to love each other so much, to live outside of time, detached. . . Detached!" A little later (the next day?) Marcello, evidently inspired by Steiner to do some serious writing, is seen working at his typewriter at a beachside café. The waitress there is the essence of utter innocence, and Marcello is captivated – not by carnal lust, but by such an image of untarnished genuineness. Paola represents another image of life, another pathway – unreflective immediateness – which Marcello encounters but over which he does not linger. This notion is revisited at the end of the film. At this point we are about halfway through the film. The remainder of the story depicts progressive estrangement and detachment from authentic communication. This detachment is not the intellectual, Platonic detachment that was seemingly invoked by Steiner, but merely distraction from serious engagement. The next day Marcello is informed that his father, a professional salesman, has visited Rome and is looking for him on the Via Veneto. 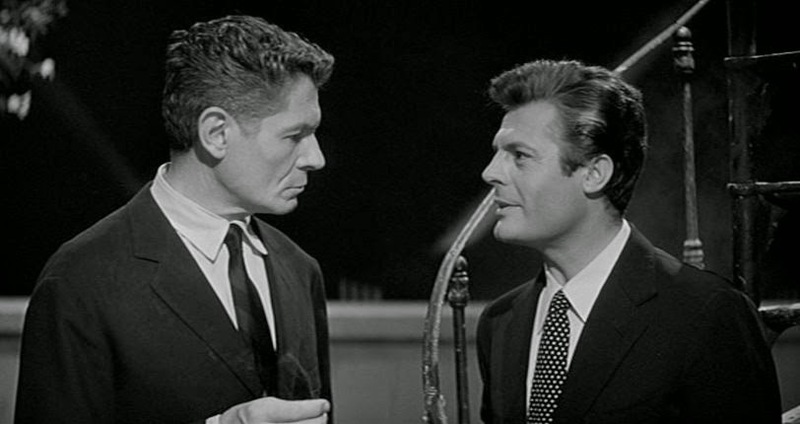 They meet up, and Marcello entertains his father at a Roman nightclub. But this sequence, also interesting in its portrayal, shows Marcello how little he knows about his father and how separated they are from each other. Their mutual lack of interest in each other both bemuses and troubles Marcello. The next evening Marcello has further tempestuous interactions with the overly-clinging Emma, and this is followed the next morning by the shocking news that, while his wife was out, Steiner killed his two children and committed suicide. Evidently Steiner was unable to face the darkened world that his fearful imagination only skirted. The ensuing scene of the paparazzi almost fiendishly buzzing around Steiner’s bewildered wife when she is informed of the tragedy is one of the most memorable moments of the film. The final sequence shows another party of wealthy time-wasters. What makes this party different? Here, some time may have passed, and things have degenerated further. Marcello has given up his job as a journalist and become a cynical publicist. Now, there is no pretense at telling the truth: he writes the lies that his employers pay him to write. While the previous scenes showed refined decadence, this sequence descends entirely into depraved and destructive debauchery. The determinedly enamored Emma is now nowhere in sight. In the early hours of the morning, the inebriated partygoers go down to the beach and see that some fishermen have netted a huge sea monster (looking like a giant stingray). The estrangement of the curiosity seekers is complete. They look at the sea monster with utter revulsion, and yet they try to make jokes about it to amuse themselves, too. In the final moments, Marcello notices Paola from a distance. She is waving to him, but what was once the image of pure, innocent engagement is now bewildering to him. He doesn’t even remember her. Emma represents drudgery and routine – the promise of a boring life of duty. Maddalena represents complete self-indulgence, a never-ending search for momentary distractions. Sylvia represents fantasy that can never reach realization. Marcello’s father represents estrangement from the traditional values on which he was raised. Steiner represents the reflective life that is so detached from genuine engagement that it can undertake its own dissolution. We are left with only Paola. Is she, too, an illusion, or does she represent the only real way? To describe it this way may make the film seem schematic and artificial, but as brought to cinematic realization by Fellini, La Dolce Vita has a narrative movement that is continually gripping. 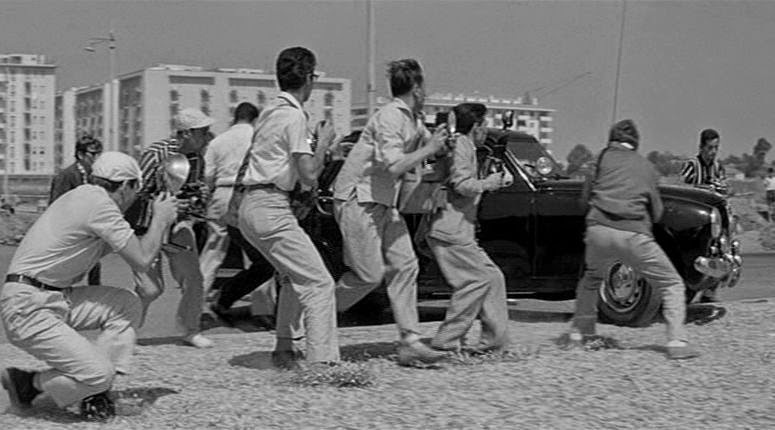 It is interesting to compare La Dolce Vita with Michelangelo Antonioni’s vaguely similar La Notte (1961). After all, the two films were both made at about the same time, both starred Marcello Mastroianni, and both were centrally concerned with existential aimlessness. But there are significant differences between the two films, as well. Antonioni’s film focuses more on the multiple internal psychologies of the four principals, each of whom attempts empathetically to ascertain what others around them are really thinking. 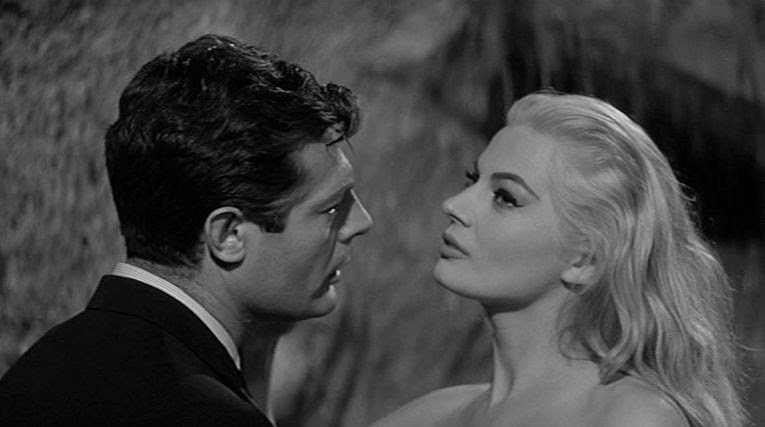 Fellini’s La Dolce Vita, on the other hand is more externalized – the psychological ambience in this case is created by the exterior world around Marcello, as realized expressionistically by Fellini. The philosopher Martin Heidegger refers to authentic and inauthentic being, two fundamental ways of personal existence . When we are inauthentic, we often attend to what we assume that “they” (a collective, unspecified other) are thinking and demanding; we are existing in accordance with our inner compass. Heidegger says that we all are mostly and for the most part inauthentic, but sometimes, when we are true to our inner natures, we are authentic. In this regard the main characters in Antonioni’s La Notte continually strive for the illusive authenticity. They seek authenticity in themselves and others. In La Dolce Vita, however, authenticity is less explicit and even more remote, perhaps only fleetingly suggested by the characters of Steiner and Paola. On the whole, though, one has to admire the mastery of Fellini's cinematic storytelling. There are numerous scenes in La Dolce Vita that will linger in your memory for years. Roger Ebert recalls seeing the film five times over a period of almost forty years, and each time he saw new things in the film to appreciate . This is what great films can offer – a portrayal of the fundamental issues of life that we can relate to our own most personal experiences. Martin Heidegger, Being and Time (1926/1953/1996), Joan Stambaugh (trans. ), State University of New York Press, New York, pp. 126-130. Roger Ebert, “La Dolce Vita”, RogerEbert.Com, January 5, 1997. 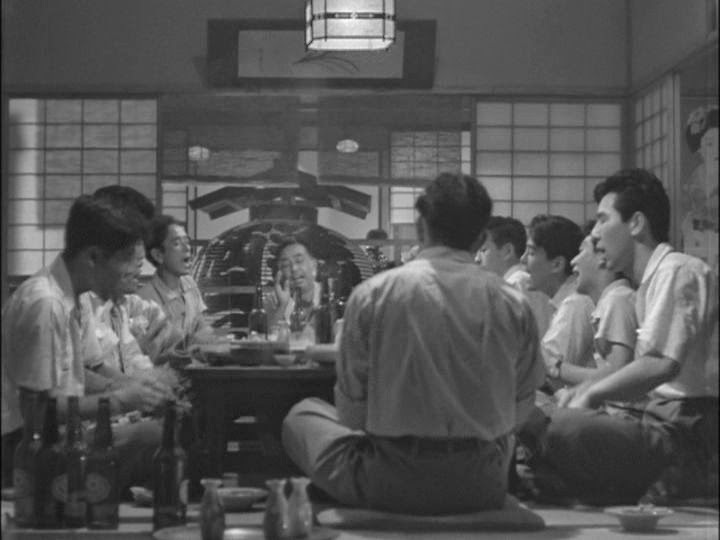 Ozu’s mise-en-scene was famously different from most other filmmakers across the globe, although his style has directly influenced some filmmakers, such as Hou Hsiao-Hsien. His camera is almost invariably set at a low angle, as if from a low sitting position and looking up at the characters. The image compositions are static, and there is almost no camera movement. Even when the camera tracks horizontally, it maintains a fixed composition on the principal characters of the shot. Thus the camera seems to be rooted to the environment, and pays little attention to the eye-line axes of the characters. Nevertheless, there is quite a bit of cutting on action, which evokes the idea of the camera representing the “invisible” witness whose focus of attention changes naturally with an action cut. 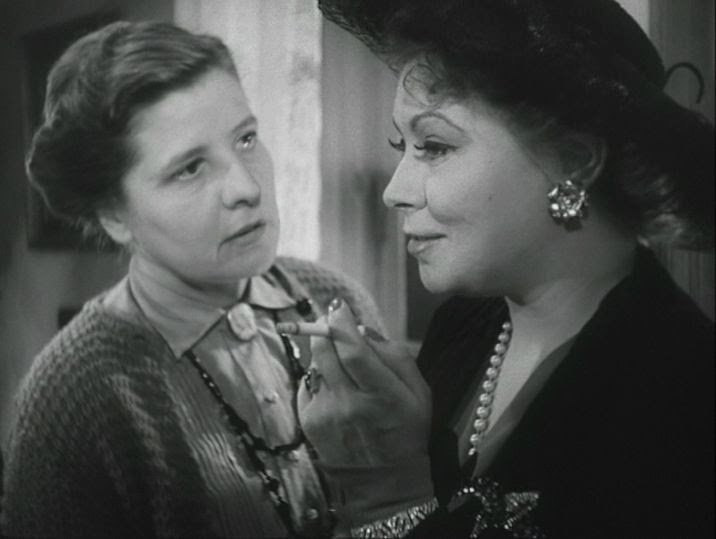 Sometimes, at dramatically significant moments in the story, there is a straight-on camera shot, with the principal character speaking directly to the camera, which places the invisible witness directly in the middle of the interaction, empathetically assuming the role of the recipient of the speaker’s words. 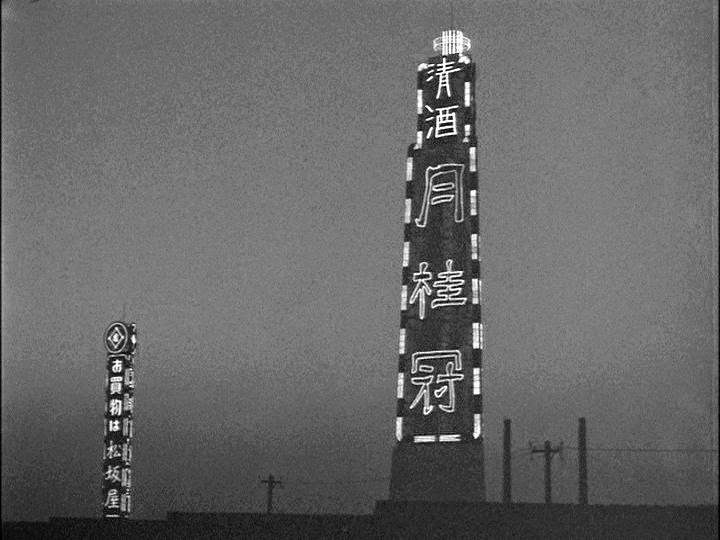 For scene transitions, Ozu often shows static cityscape images that are empty of human content. Sometimes these scene transitions elliptically pass over a significant piece of action that must be inferred by the viewer. Altogether these effects create their own special cinematic atmosphere that seems to place the viewer in an intimate position to witness the scene, and yet not always privy to everything that is going on. Ozu probably developed this consistently rigorous visual methodology during his early days in the period of silent filmmaking. Surviving storyboards of Ozu’s work show his meticulous concern for background compositions and are indicative of his static camera methods . “The director’s storyboards suggest Ozu envisioned his trademark rigorous-style compositions long before cameras rolled. In them, sets are lined with geometric beauty and are much darker than drawings done to illustrate the characters.” – quoted from “Ozu's Movies Continue to Win New Fans”, by Noriki Ishitobi and Aiko Masuda, The Asahi Shimbun, January 28, 2014. 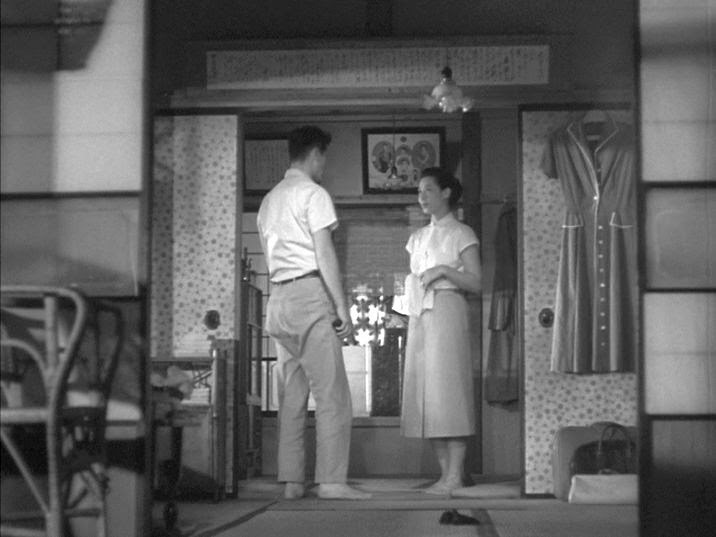 Like most of the films of his mature period, Yasujiro Ozu’s Late Spring (Soshun, 1956) concerns the various personal and social relationships that structured contemporary middle-class Japanese life. In this case the primary theme concerns the workaday dissatisfactions among the burgeoning class of low-level white-collar workers. The men (the primary breadwinners) refer to themselves as “salarymen”, and for the most part, they feel their work is boring and meaningless – they merely work to collect their meager weekly salaries. The story concerns one of these salarymen, a young married office worker, and it traces events that bring about a crisis in his life. The ending of this crisis may bring about different critical interpretations, depending on how one views the bigger social picture. But whatever your interpretation, a key component of the film is, of course, the manner in which Ozu tells the story cinematically. Using these cinematic techniques, Ozu presents in Early Spring over the course of two hours and twenty-four minutes, Ozu’s longest film, a close-to-the-ground study of the pointless tedium of modern middle-class existence. Despite the careful brush strokes, however, I wouldn’t say that this film aesthetically matches the enervating existential ambience of Olmi’s Il Posto (1961). Chiyo Kaneko, “Goldfish”, (Keiko Kishi), a girl at Sugiyama’s work place. The salarymen milieu at the company office. It is this third sphere that is, in my view, the most important. The story moves through four stages, and in each stage the three subject spheres are visited. In the first part, we are introduced to the rather regimented world of the Tokyo office workers . They all live in cramped apartments, all wear the same “office” clothes, and commute back and forth to work in crowded trains. Sugiyama and Masako are just one couple in this crowd. During a lunch break, a number of the workers decide to break the monotony of work by going on a day hike at a nearby mountain. On the hike, Sugiyama begins chatting with a girl from the company’s typing pool, “Goldfish”. Soon they are shown having lunch together, and thanks to the vivaciousness of Goldfish their acquaintanceship blossoms into an affair. 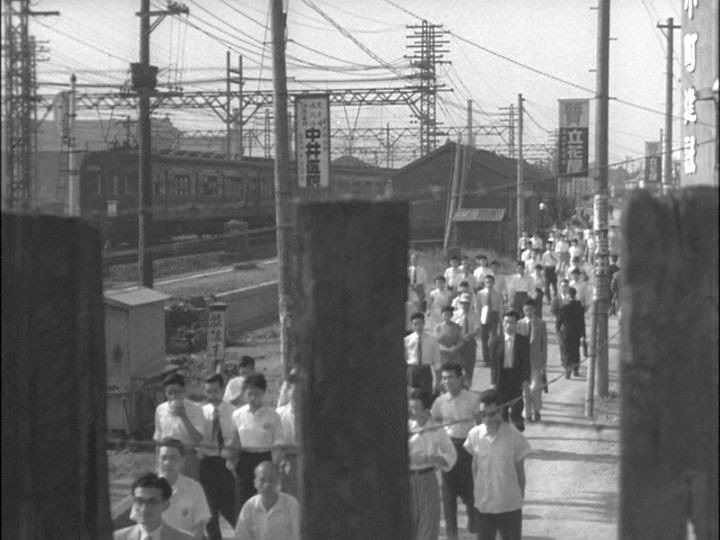 The actual moments of passion are omitted by Ozu’s ellipsis here. Although Sugiyama and Goldfish conceal their relationship, their gossipy coworkers at the office begin to suspect something. A few of them arrange a fake party that is intended to serve as a kangaroo court to accuse Goldfish and Sugiyama of adultery. Sugiyama is preoccupied with news that he is going to be transferred by the company to the remote town of Mitsuishi, and he misses the setup party. But Goldfish show up, and she is reduced to tears by their nasty allegations. Eventually the suspicious Masako becomes sure of Sugiyama’s infidelity, and their ensuing quarrel leads to her moving out of their apartment to go live with a girlfriend. Masako cuts herself off from Sugiyama, hanging up the phone when he calls her up. So Sugiyama glumly goes off alone to Mitsuishi to take up his new post. In the end, though, friends and family intervene to convince Masako to go join her husband. They meet up, mutually apologize, and agree to start a new life together. Some people view this story as a heartwarming domestic drama about a good traditional marriage that is almost ruined by the crafty machinations of the immoral Goldfish. According to this view, Goldfish, whose hairstyle and clothing have a Western look, represents the corrupting influences of modernity. Sugiyama is seen as initially succumbing to the evil temptations, but he eventually repents, and order is finally restored by his forgiving wife. But I take a different view. To me the film is about the hollowness of “modern” Japanese middle-class life. Among the men at the office, there is little authentic communication. They compulsively reach for their cigarettes in order to give the appearance of being occupied. Much of the time they complain about the barren life horizons of all the salarymen . At one point in the story when Sugiyama is having a drink at a bar, he hears an elderly white-collar worker at the adjacent barstool tell him, “I’ve worked 31 long years to find life is just an empty dream.” In fact in this social climate, drinking alcohol seems to be the only means that a man has to throw off the yoke of his social harness and be uninhibited. This is shown when Sugiyama gets together with his war veteran buddies, and they all get heavily and satisfyingly drunk. In the milieu of the women, life is equally dreary. Masako chats with her mother and various female acquaintances, and they all tell her that men are inherently cheaters. Although the mother is rather stoic about this, the others advise her to make men suffer as much as possible for their sins. Goldfish, in fact, is the only authentic person in the story. She is the one person who can feel love, honestly express her emotions, and make direct engagement with the people around her. Her habitually good-natured demeanor arouses jealousy. When the man she loves, Sugiyama, turns his back on her, she accepts and forgives him, only asking him to be honest with her. At the kangaroo-court party after Goldfish departs in tears, the men, who had just sanctimoniously attacked her, then admit to each other that it was probably Sugiyama who had seduced her. This is an erroneous belief – Goldfish had actually seduced Sugiyama – but it shows how men typically and immediately heap blame on women for acts in which they themselves are complicit. They go on to confess that they actually envy Sugiyama’s good luck at having scored with Goldfish. Hypocrisy is the rule with everyone but Goldfish. So to me the narrative of Early Spring ends gloomily – as a defeat. Sugiyama and Masako succumb to the oppressive, dead-end system that surrounds them and vow to make a go of it. But the joys and wonders of life, its magic as represented by the way Goldfish engaged with it, are evidently abandoned. This is a sad ending indeed. The Lonely Crowd (1953), by David Riesman, Doubleday Anchor Books. "Utopian reveries spill forth almost daily from the oracles of progress, forecasting a transformation of Information Age labor into irrepressible acts of impassioned fun. But we know all too well the painful truth about today’s ordinary work routines: they have become more, not less, routinized, soul-killing, and laden with drudgery. The computerization of the workplace brought regulated workflows, surveillance by managers, deference to the dictates of software, and a machine with which you couldn’t keep up. It meant a noticeable loss of autonomy and a dawning sense—seen in the rapid turnover guaranteed by planned obsolescence—that productivity and growth had become ends in themselves. The most dangerous -isms turned out to be those preceded by 'Ford' and 'Taylor,' and they exerted their ultimate hold by becoming technologized and dispersed throughout our homes, our offices, our cars, and our cities." The earliest films that Ingmar Bergman directed, in the 1940s, are often dismissed by later critics as prosaic and jejune. In particular, this is probably the critical consensus concerning the very first film that the 27-year-old Bergman directed, Crisis (Kris, 1946) . 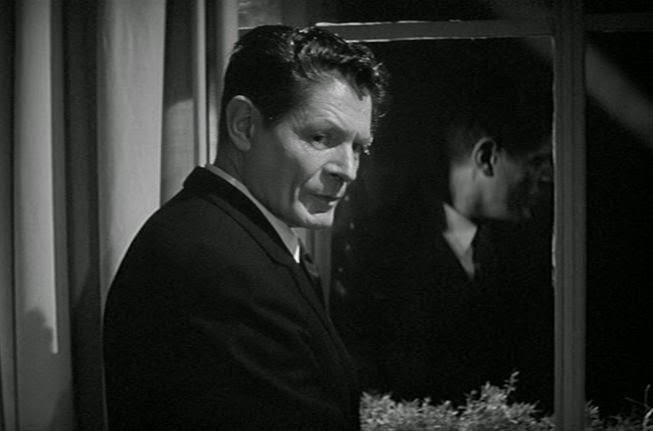 However, when I recently saw it, I found the film full of interesting stylistic flourishes that make it stand out even today; and in fact I think the film is superior to his later Thirst (Törst, aka Three Strange Loves, 1949). The story, scripted by Bergman and based on a Danish radio play, Moderhjertet (The Maternal Instinct) by Leck Fischer, concerns the psychological turmoil surrounding five principal characters variously encumbered by their own obsessions. The presumed protagonist, Nelly, is a teenage girl who has become the center of attention for the other four principals. But actually the narrative focalization is rather diffuse and spread out beyond the protagonist across those other principals, too. Nelly (played by Inga Landgré), an 18-year-old girl hoping to leave the humdrum confines of her small town in search excitement in the big city. Ingeborg Johnson (Dagny Lind), Nelly’s stepmother who has been looking after Nelly since she was a baby. Jenny (Marianne Löfgren), Nelly’s birth mother, who has come to visit Ingeborg in order to reclaim the daughter that she had abandoned 18 years ago. Jack (Stig Olin), the oily, self-centered boyfriend of Jenny who falls in love with Nelly. Ulf (Allan Bohlin), a thirtyish and decent, but unexciting, village local who hopes Nelly will accept one of his repeated marriage proposals. As the story unfolds, we see that Ingeborg, Jenny, Jack, and Ulf all feel that only Nelly can supply them with fulfilment that is missing from their lives. But Nelly is confused and noncommital about all of them. What makes this situation and its presentation interesting is not Nelly, who appears rather conventional and not particularly endowed with personal magnetism. Instead, it is the way Bergman fashions an expressionistic atmosphere around the personages of Ingeborg, Jenny, and Jack. All three of them are facing existential crises, and Bergman’s mise-en-scene is employed at full tilt to externalize their intense inner turmoil. The narrative passes through four phases. In this part we are introduced to the five characters. Ingeborg is a spinster piano teacher in the small town, who looks after her maturing “daughter” Nelly. We also get the foreshadowing hint, which will be confirmed later, that Ingeborg is dying of a terminal disease and doesn’t have much longer to live. Ulf is shown lurking around Nelly and hoping for a response, but she dismisses him as too old and laughs off his marriage proposals. After having abandoned her newborn daughter to Ingeborg 18 years ago, Jenny shows up at Ingeborg’s house to reclaim Nelly and take her back to the big city. Soon Jenny’s boyfriend, the self-consciously suave and knife-wielding Jack, shows up, too, and it is obvious that his presence spells trouble. They all plan to attend the village ball that evening. “This is a moonlit life. Not yet for you, but you’ll soon see. . . unreal light, darkness, and shadows, and all manner of frightful things." He repeats this moonlit imagery several times later in the story, as if it represents a capsule summary of his obsessive melancholic psyche. Although Ulf shows up and punches out Jack, it is clear that Nelly is attracted to the city slicker, and she informs the distraught Ingeborg that she will immediately leave with Jenny for the city. Nelly is now in the city, and some time has passed. Ingeborg comes for a visit and observes that the relationships between Jenny, Jack, and Nelly are riven with jealousy and are unraveling. The next day Jack, now unshaven and in rags, shows up at Nelly’s apartment and appears to be a different person and even more deranged than usual. He tells Nelly a fantastic story about how he has just murdered someone (presumably Jenny) – but she succumbs anyway to his embraces, and they make love. Then, to Nelly’s shock, Jenny hauntingly shows up alive and well at her apartment and confronts the unclad girl in her bed. This sets up a final confrontation between Jenny, Jack, and Nelly that has disastrous and fatal consequences. The final segment, which is rather flat, shows Nelly returning to the village to live with Ingeborg. Ulf is there waiting for her, but Nelly is too traumatized by what has happened and has no patience for his hang-dog entreaties. On the surface and probably to most critics, Crisis merely represents the well-traveled territory of small-town innocence briefly enticed by big-city corruption. But the way this story is told suggests penetrations into deeper psychological issues of existential angst that would underlie many of Bergman’s later works. Bergman’s cinematic expression is already well-developed here. Regrettably though, the musical score on the soundtrack, which is loud and trashy, doesn’t match the narrative and is only an irritating distraction. As mentioned, the interesting characters are Ingeborg, Jenny, and Jack, all of whom are drawn with an expressionistic brush. At first, the characterizations of Jenny and Jack appear so exaggerated and repulsive that one is tempted to dismiss them as overblown stereotypes. But Ingeborg, Jenny, and Jack all turn out to be self-reflective characters, and the narrative focalization is equally weighted on them. Ingeborg may seem colorless, but her understated anxiety is always present, since we know that she has only a couple of years left to live. She craves to spend that limited time with her beloved adopted daughter, but she doesn’t reveal her doomed condition to others. 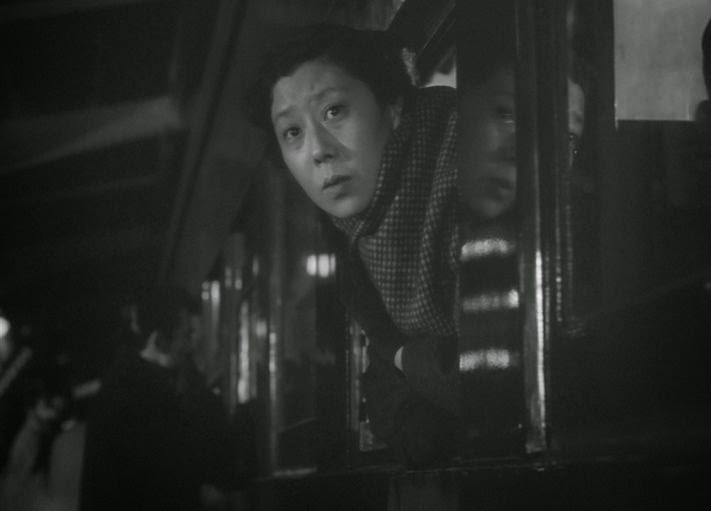 I particularly liked the depiction of the nightmare that she had on the train when she returned from the big city. Although she has devoted her life to selflessly serving her adopted daughter, when she pleads to God in her dream for salvation from death, she recognizes that she is not guiltless – she anguishes over the thought that she has coveted Nelly’s presence in her life for her own happiness. Realizing, when we are in dire straits, that we don’t really deserve favors from God probably comes to all of us at some point. Jenny appears as a vulgar and insensitive woman, someone who looks quite a bit older than her purported 36 years of age . But she, too, turns out to be a self-reflective person, and we occasionally get glimpses of her own anxieties – she is more interesting than she first appears. She has evidently had a hard life, and now that she has finally earned some money she seeks to extend her youth by living off younger people that she thinks she can buy – Jack and Nelly. Bergman had earlier written the screenplay and served as the assistant director for Alf Sjöberg’s Torment (Hets, 1944). Interestingly, though, actress Marianne Löfgren was 36 at the time of filming. Ageing appearances have changed over time. 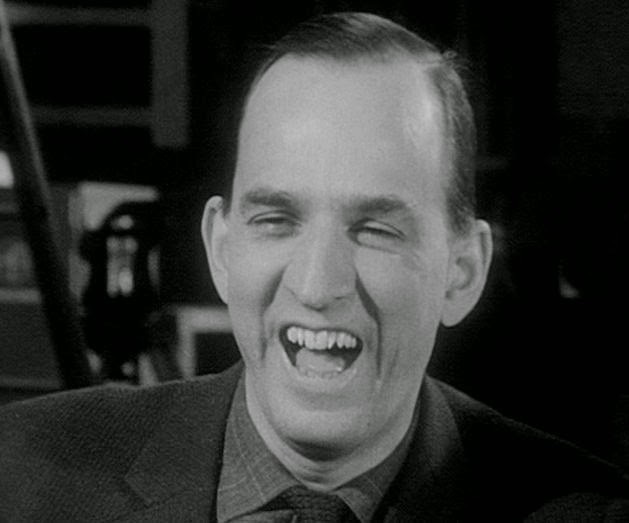 The documentary Ingmar Bergman Makes a Movie (Ingmar Bergman Gör En Film, 1963) is a uniquely detailed examination of a great film director in action. Bergman, who was engaged at that time in the production of his feature, Winter Light (1963), was at the peak of his career and already critically regarded as the world’s best filmmaker. What makes this documentary special is the intellectual intimacy that director Sjöman was able to achieve with Bergman and display in the presentation of the film. 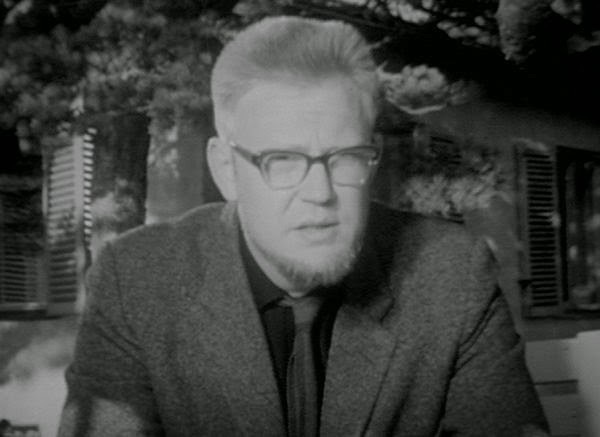 Sjöman at this time was a film critic and an aspiring auteur, himself, interested in gleaning all aspects of Bergman’s craftsmanship – in fact he was engaged at this time in the production of his own first feature, The Mistress (1962). He would later go on to achieve world notoriety for his controversial politoco-cinema-verite features, I Am Curious Yellow (1967) and I Am Curious Blue (1968). Regrettably, Sjöman had not absorbed one of Bergman’s fundamental maxims: “film is about rhythm”, for a progressive rhythm is missing in Ingmar Bergman Makes a Movie. Adhering to a linear time structure through the filmmaking process was probably a contributing factor to this problem, because the opening section concerning the script-writing lacks necessary context and motivation. As it stands, this first section is mostly a rather boring talking-heads interview with Bergman. The only interesting element in this section is Bergman’s revelation concerning how insecure he used to feel about writing. Given his prolific production of film scripts, I would have thought that he would have had no qualms in this area. This intriguing admission notwithstanding, I can imagine some viewers giving up on the film during this relatively static early part and not sticking through the remaining segments. That would be unfortunate, because the film, despite its narrative deficiencies, contains a number of interesting nuggets about filmmaking technique and Bergman’s approach to it – so much so, in fact, that this film should probably serve as essential material in any filmmaking curriculum. After all, for documentary films in particular, the important thing is not so much what is behind the camera but what is in front of it. When we get into the filming sections, parts 1 and 2, things get more interesting. 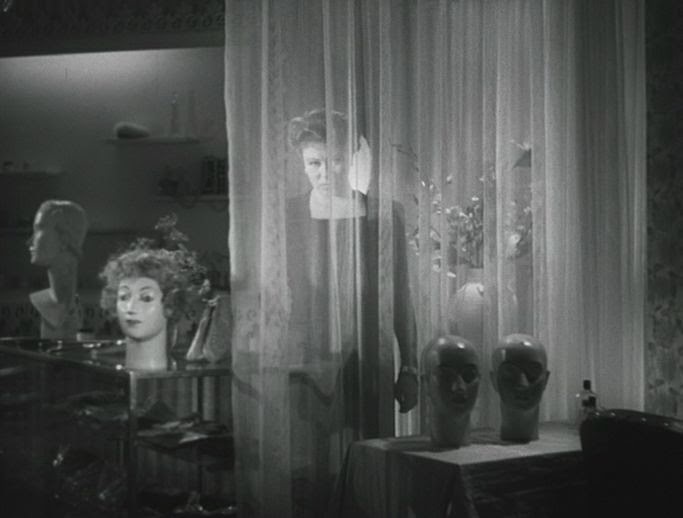 Berman worked closely with his cinematographer, Sven Nyquist, and together they plotted out how to achieve Bergman’s original vision with respect to lighting and image composition. Bergman is shown blocking out an individual scene for his lead actors, Gunnar Bjornstrand and Ingrid Thulin, in considerable detail. This is followed by extensive rehearsals with the actors in order to settle on just the right tone and expression for everything that is said in the scene. 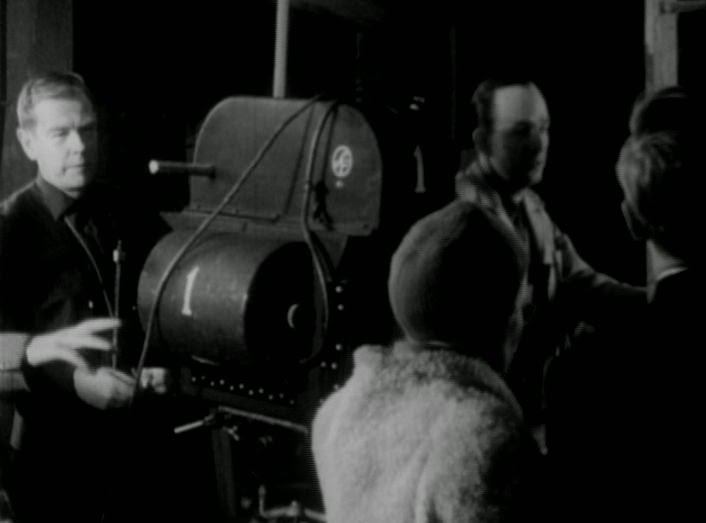 Sjöman’s camera prowls around the set following Bergman in his work, trying to sneak up and capture the details without getting in the way of Bergman and his crew and interfering with the production. Although Bergman didn’t allow Sjöman to film much live camera action for the Winter Light shooting, it is still amazing that Sjöman was able to get as close in as he did to Bergman’s rehearsal activities, which of course are a crucial aspect of the filmmaking. In these scenes it is interesting to see how Berman operates. He seems relatively relaxed and low-key around Thulin and Bjornstrand, with whom he had worked many times before, but he nevertheless maintains strict control of everything and everyone around him. He confessed that he has to treat inexperienced, and therefore insecure, actors much differently from experienced actors when he wants them to alter their performances according to his wishes. With an experienced actor, he can be curt and aggressive, but with an inexperienced actor he had to be more subtle. A particular concern of Bergman’s was the maintenance of emotional continuity between scenes. The action of Winter Light takes place over only a three-hour period of a single day, but the shooting of those scenes took several months. So when a particular scene was to be shot, Bergman and his assistants had to pay close attention to the emotional nuances that had been present in the script’s immediately preceding scene (which, for all we know, may have been shot some time ago or may not to this point in the shooting have been filmed). Another interesting point that I had not heard before was Bergman’s remarks about the energy of his actors. He felt that actors might become less energized as the production proceeds and that he felt the need to invigorate them with more energy to maintain continuity on this level, as well. Moreover, he said that as a film viewer watches a two-hour film, he or she will inevitably become psychologically fatigued. To counteract this fatigue, the latter stages of a film must inject more energy and stimulate the viewer somewhat. To achieve this, he felt that the actors should display a bit more energy in their performances towards the end of the film. 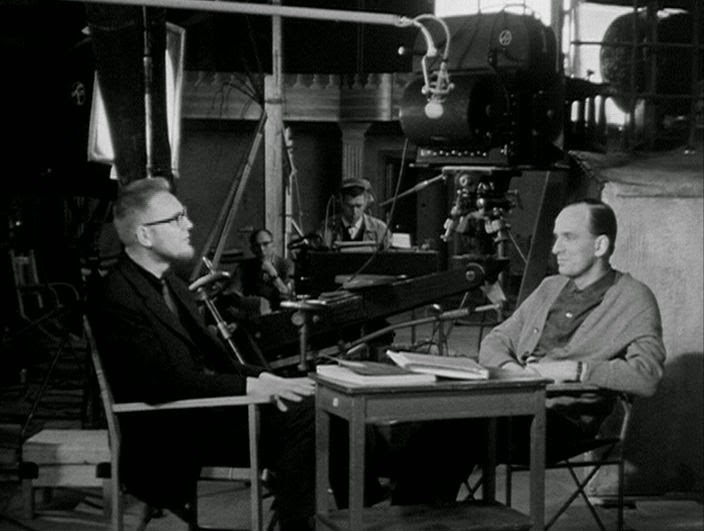 With respect to camera rhythm, Bergman said that he liked to make editing cuts on action. His explanation for why this is psychologically effective is very well stated. As the viewer refocuses his or her attention on the principal character in focus when there is some significant character movement, a cut is less noticeable and therefore less psychologically disruptive. Even though Bergman has carefully “blocked out” (i.e. worked out the sequence of camera positions) prior to shooting, he said he still spends 6 to 8 weeks editing each of his films. In this regard, Sjöman shows us how Bergman carefully edited a short, intimate sequence of shots involving his actors Bjornstrand, Thulin, and Max von Sydow. Even though meaningful close-ups and reaction shots were required to convey the psychological nuances of the scene, Bergman progressively shortened the sequence in his editing – to the point where he removed one reaction shot on the part of von Sydow that Sjöman thought should have been retained. But the master knew better. Concerning how much of the shooting is pre-planned, Bergman contradicts himself somewhat. Alfred Hitchcock (who is not mentioned in this film) was said to plan his films so carefully that he found the actual shooting of his films to be mechanical and boring. The creative activity had taken place in the planning. Similarly, Bergman here says much the same thing at one point in this film. But on another occasion in this film, he says that he often learns new things about what should be expressed when the actors are out there in front of the camera, and he makes changes opportunistically. So the creative activity is ongoing throughout the production. There is also a brief but interesting discussion about realism and neorealism. Bergman, of course, was more oriented toward expressionism, and the “realism” he sought included the psychological domain of not only the author (the filmmaker) but also the viewer. Vilgot Sjöman, on the other hand, seems to have been more aligned with the neorealistic sides of filmmaking (at least on the basis of what I saw in I Am Curious Yellow). In this connection Bergman makes the insightful remark that the work “isn’t done until it’s surrounded by the consciousness of the audience”. This is true of all art, but it is particularly notable with respect to film, concerning which the viewer must always construct his or her own diegetic narrative during the act of viewing. 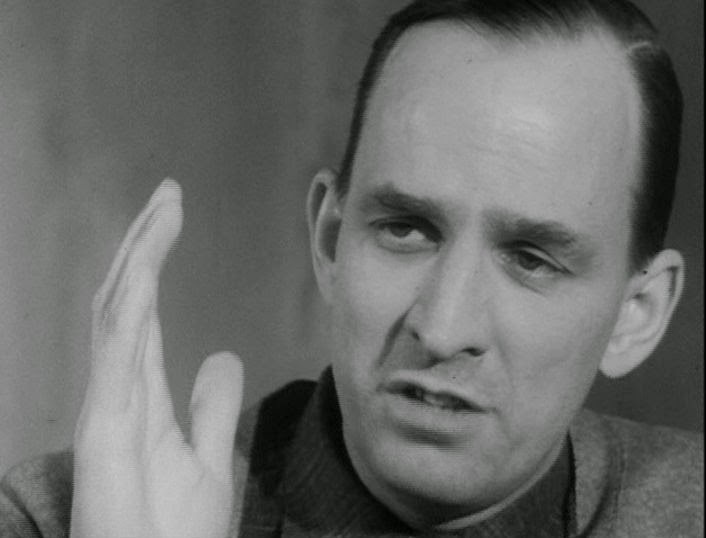 So Bergman is profoundly interested in how his film-viewing public see his films, particularly in connection with his films during this period of his career that expressed his own concerns and the path that he was working through in connection with faith in God. Indeed, Winter Light was subsequently considered by many critics to be part of Bergman’s “Trilogy of Faith” that included Through a Glass Darkly (1961) and The Silence (1963). Given this degree of personal expression, it is not surprising that Bergman sought to insulate himself from the potentially depressive effects of critical reviews, which often appear before the film is officially released. He discusses this issue briefly with Sjöman and reminds him that one should “never, ever respond to a critic. . . . never discuss with a critic” – an interesting remark, since Sjöman at this time was primarily a critic. Near the end of the film, Bergman then turns the tables on Sjöman and starts interviewing the interviewer concerning how a critic feels about films and the degree to which a critic might take pride in the publication of a damning review of a new film. This is only fair, because Sjöman has cast himself in a more prominent role in this film than one might have expected. The critic and neophyte filmmaker has queried the master, almost impertinently as an equal might have done, and we frequently see full frontal closeups of Sjöman expressing his questions and thoughts. To some extent this is a strength of this film, because by placing himself on an equal footing with Bergman, Sjöman achieves a more intimate and conversational interaction with him, thereby eliciting more thoughtful responses. But Bergman puts his interlocutor in his place in the end. He slyly reminds Sjöman how distraught he (Sjöman) had been when he had seen the first, damning review of his own first feature, The Mistress. And with this needling, the sober and thoughtful Bergman erupts with an uproarious horselaugh. Charade (1963) was something of a cinematic pastiche, and so it drew various responses. It was a both a light-hearted romantic comedy and a corpse-strewn spy-thriller, coming hot on the heels of the debut of the James Bond films. Above all, it was a star vehicle for its two luminous leads, Cary Grant and Audrey Hepburn. Depending on your tastes, you may be attracted to one or another of these slants to the film. Echoing Hepburn’s breakthrough film of a decade earlier, Roman Holiday (1953), Charade also featured some tourist-oriented location shooting – in Paris this time and in color. Cary Grant had been approached to appear opposite Hepburn in Roman Holiday, but he had declined because of the 25-year age difference between himself and Hepburn. However, ten years later and now 59 years old, Grant signed up to co-star with Hepburn in Charade. 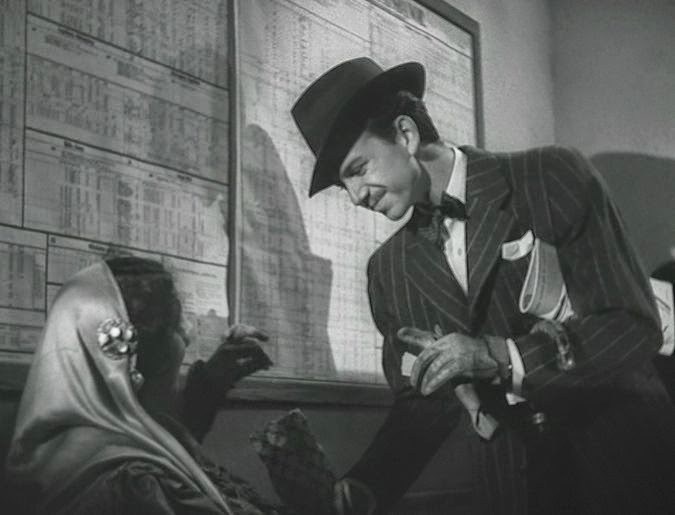 But Grant’s continuing concern for the age difference led to his insistence that any romantic approaches in the film would have to come from Hepburn’s side. So in this film Hepburn is the amorous aggressor, virtually throwing herself at Grant throughout the story. This doesn’t come off as at all natural to Hepburn’s screen persona, and yet it turns out to be one of the key tones of the film. Since Hepburn here is the vulnerable heroine surrounded by sinister predators, her willing submission to the charms of a reserved and duplicitous character greatly accentuates her vulnerability and the film’s emotional tenor. The film’s story goes through four phases that correspond to four different personae that the character played by Cary Grant assumes. The first three phases are almost equal in length and make up most of the film. While on a ski holiday Mrs. Regina Lampert (Audrey Hepburn) confides to a friend that she intends to divorce her husband, and shortly thereafter she also meets a charming stranger, Peter Joshua (Cary Grant). When she returns to Paris, Regina learns that her husband has been murdered and that their apartment has been stripped bare. At her husband’s sparsely attended funeral, three mysterious and sinister looking characters show up; and Regina is later informed by CIA administrator Hamilton Bartholomew (Walter Matthau) that they are Tex Panthollow (James Coburn), Herman Scobie (George Kennedy), and Leopold Gideon (Ned Glass), who, along with her husband Charles and a fifth character, Cameron Dyle, had stolen $250,000 in a World War II OSS caper. Evidently Cameron Dyle died in the war, and Charles Lampert had made off with all the money himself. The three surviving OSS conspirators apparently killed Charles to get the money and now will assume that Regina has the money and will try to kill her, too. Meanwhile Peter Joshua shows up in Paris and helps Regina move into a new hotel. Regina is shown in short order to be amorously attracted to Joshua. Regina is now threatened by Tex, Scobie, and Gideon, and Peter Joshua tries to help her. But it soon turns out that he wasn’t to be trusted in the first place – his true identity is now understood to be Alex Dyle, the brother of conspirator Cameron Dyle, and he is now in league with the other three. But Regina quickly suppresses her misgivings about “Peter Joshua’s” false pretenses and whole-heartedly throws herself in with Dyle. None of the cutthroat conspirators trusts each other, and before long Scobie is found drowned in a bathtub, presumably the victim of one of the other three. All along Regina keeps talking on the phone to Bartholomew and learns that Carson Dyle never had a brother. So it is now clear that the Cary Grant character was lying about being Alex Dyle, too. Regina confronts “Alex”, who now admits to being a professional thief, named Adam Canfield, who is out to steal all the money for himself. Again Regina forgives his relentless mendacity and throws herself (in Hepburn's delicate style) at him again. Along the way, there is a nice trick about how the $250,000 was secreted in plain sight. Tex, Canfield, and Regina figure it out. But soon the corpses of Tex and Gideon are discovered, and Regina now assumes that the real killer can only be Adam Canfield. Regina arranges to meet Bartholomew, who turns out not to be a CIA agent named Bartholomew, but instead the most villainous of all of them. But in the end Grant (a) saves the day, (b) turns out not to be Adam Canfield, but an upright US Treasury official named Brian Cruikshank, and (c) ends up betrothed to the continually enamored Regina. 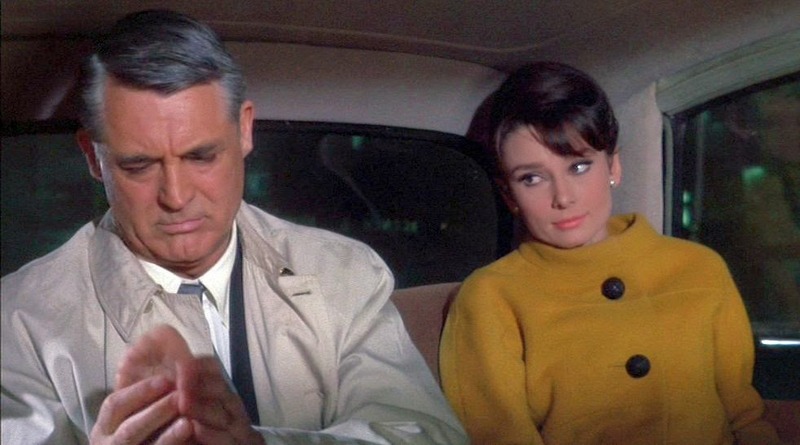 As a vehicle for Hepburn (and Grant), Charade does fill the bill, but when compared to the earlier Roman Holiday it doesn’t measure up. Both films have a theme of deception and dissembling, but Roman Holiday's approach is far subtler than Charade’s. Whereas Roman Holiday presents innuendo and mistaken assumptions about perceptions, Charade merely has Grant and Matthau baldly lying through their teeth about who they are and what they do. There are other limitations about Charade, as well. The characterizations of villains – Tex, Gideon, Scobie, and the false Bartholomew – are schematic and grossly exaggerated to the point of being cartoon characters. Matthau, as the false Bartholomew, is made out to be particularly slimy and crude, but this characterization is overdone. 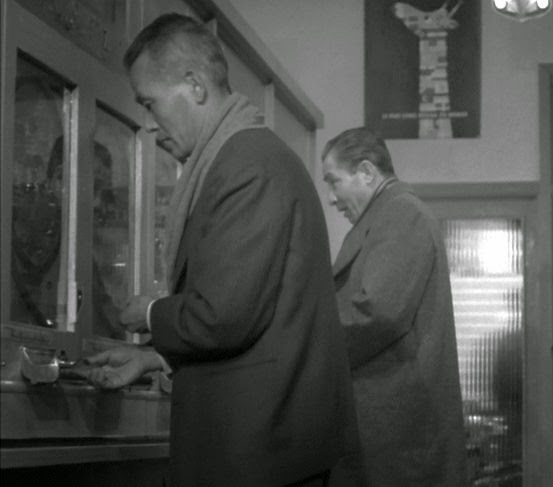 There are also five violent murders in Charade, although we mainly see only the outcomes, i.e. the corpses, and are spared from viewing the grisly killings. The depictions of these murders are apparently supposed to be funny and in tune with the general tongue-in-cheek cartoon ambience. Along these same lines of exaggeration, Peter Stone’s script features dialogue that is full of sarcastic one-liners, particularly from Grant, but to me, they are mostly artificial and charmless. The cinematography is also not as artful as in the best films. Of course it is not surprising to see unnatural lighting of some studio-lit process shots showing outdoor scenes in the background, since this was characteristic of that period of color filmmaking. But there are several pointlessly high overhead shots that don’t fit in well with the narrative rhythm of the film. 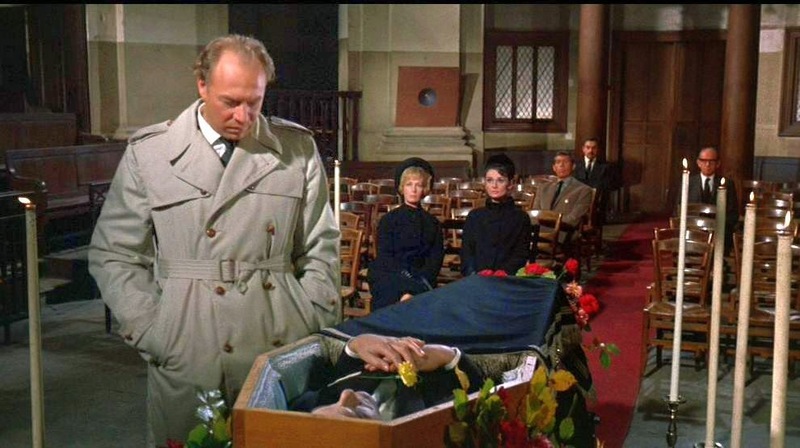 And as far as narrative focalization is concerned, I won’t even discuss the prankish point-of-view shot from inside the coffin as the undertaker closes the lid on Charles Lampert, but there are some oddities here, as well. In addition there is some awkward editing, with jump cuts connected to the ends of some moving-camera shots. These weaknesses in the schematic narrative, artificial dialogue, cinematography, editing, and some of the performances of the villainous characters can be forgiven, I suppose, if they don’t interfere to much with our main interest – the romantic relationship between the two leads, Hepburn and Grant. For his part, Cary Grant is his usual charming self, but his performance is variable. Most of the time he seems relatively disinterested and romantically detached from Hepburn. 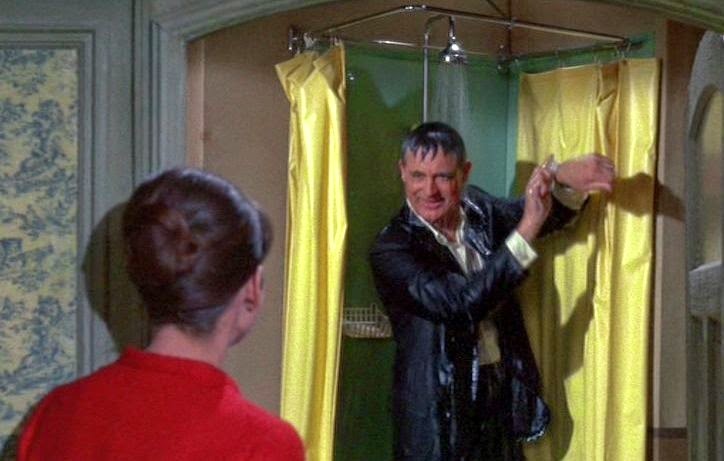 But then he sometimes paradoxically breaks out into unexpected zaniness – such as when, in almost slapstick fashion, he takes a soaking shower fully clothed in front of the astonished Hepburn, or when he gives her an out-of-character cross-eyed grin when she meets him in the end. Audrey Hepburn, of course, is one my favorite screen performers, and her magnetism is on display here. But there are some concerns, too. Her relative indifference to the death of her husband in the opening scenes is rather disconcerting. 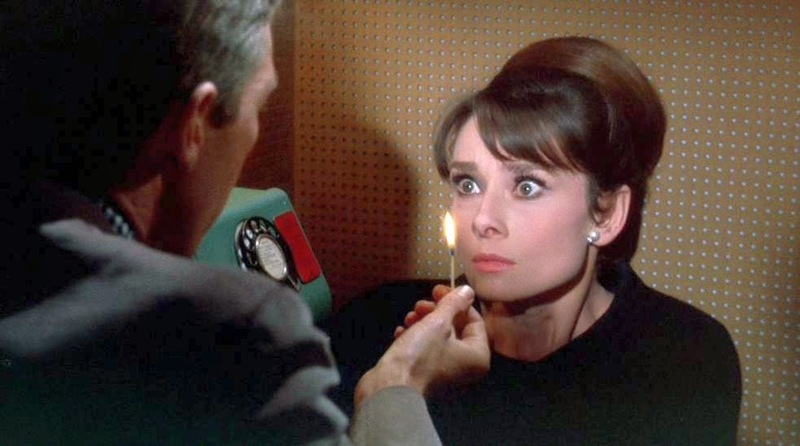 And her romantic relationship in Charade has less electricity than those of some of her other films, such as Roman Holiday (1954), Love in the Afternoon (1957), Breakfast at Tiffany’s (1961), and My Fair Lady (1964). 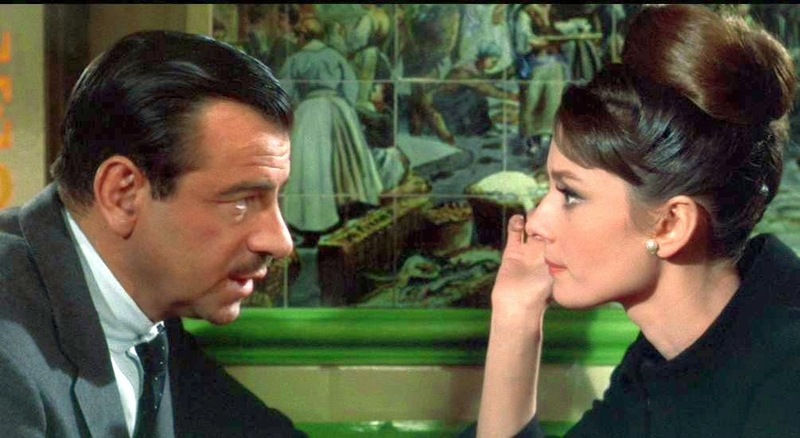 Nevertheless and despite all the shortcomings, Charade is still an entertaining film. 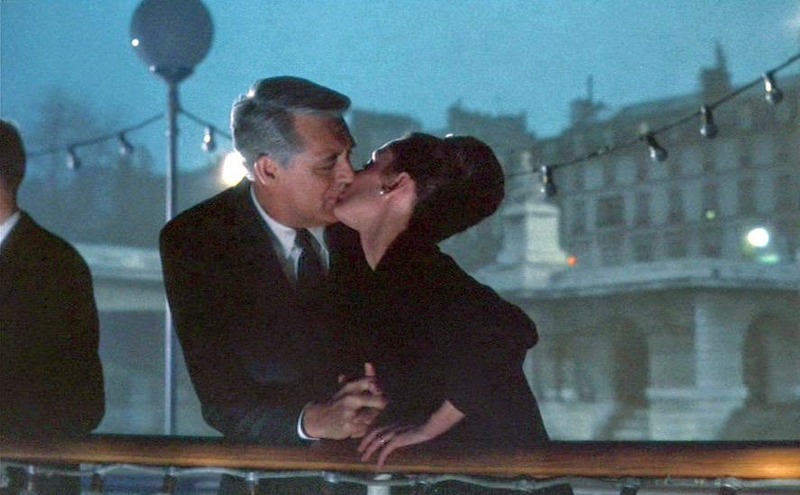 A further positive worth mentioning is Henri Mancini’s theme song, “Charade”, which is moody and memorable – almost up to the level of his “Moon River” for Breakfast at Tiffany’s.